Goalie Tim Licht saves a shot from Peyton Marter, No. 20 of Delta State in the Lions' 2-0 win on Oct. 11. 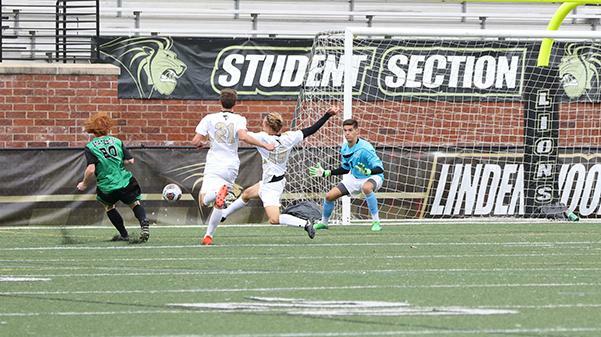 The Lindenwood men’s soccer team got off to a slow start to begin the 2017 season when it started the season 1-3-0, but since that time the Lions are 7-2-0 with four games remaining on the schedule and are looking to get a bid to the NCAA Division II tournament. Freshman Michele Ganz leads the Lions in points with 25 on the season. Ganz has 11 goals and three assists in 13 games played. Ganz has scored in each of his last five games, and the team is now 4-1. “I’m happy to feel important for the team,” he said. The Lions have gotten strong play from goalie Tim Licht, who has three shutouts on the year, two of which have come in the team’s last two victories. Lindenwood is 7-2-0 with Licht in goal this season. Lindenwood has outscored its opponents 28-14 this season, according to Lindenwood Athletics. Hutter said he is pleased with the team’s ability to score goals, but wants to cut down the goals allowed in the team’s final four games. Hutter got the performance he was looking for on Sunday when the team blanked conference opponent Upper Iowa University 3-0 in Fayette, Iowa. “We have to win absolutely; we can’t afford any missteps now,” Ganz said. In the team’s final four games of the season, three are against MIAA conference opponents. The Lions currently sit third in the conference with a record of 3-2-0. Lindenwood will travel to Searcy, Arkansas on Oct. 20 to play Harding University and then will have a week to prepare for conference opponent Fort Hays State who sits top of the table in the MIAA conference. The Lions lost to Fort Hays State back on Oct. 8 by the score of 2-1 at home. Lindenwood is in must-win territory now, and defender Johannes Brendle is confident the team can get the job done. “We have to win every single game, and if we stay connected, I am convinced we can accomplish our goal: nationals,” he said.